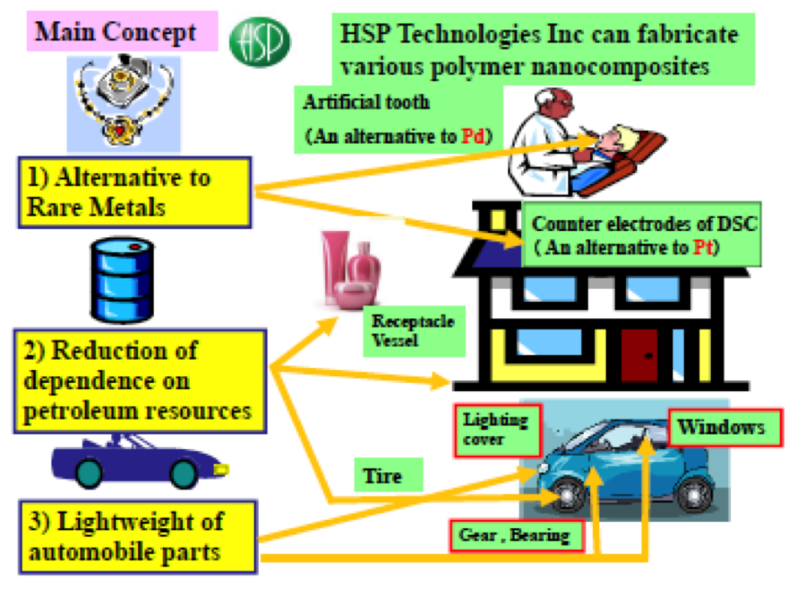 HSP Technologies Inc. succeeded in the fabrication of ternary nanocomposite composed of multi-walled carbon nanotube (MWNT), ionic liquid, and conductive polymer. This kind of nanocomposite can apply to an alternative to platinum counter electrode for dye-sensitized solar cells. The company also succeeded in the fabrication of a stretchable and conductive nanocomposite composed of elastomer/MWNT system. This material can apply to a stretchable electrode (or circuit) for the “wearable” device and sensor. HSP Technologies Inc. succeeded in the fabrication of bio-based polymer alloys composed of bio-polyethylene (bio-PE) and poly(L-lactic acid)(PLLA) using the high-shear processing. Moreover, the company succeeded in greatly improving the mechanical properties, including elastic modulus and strength of plastic (aliphatic polycarbonate) made from carbon dioxide (CO2). This kind material is expected to be alternative to fossil resource derived plastics such as polyethylene and polypropylene. 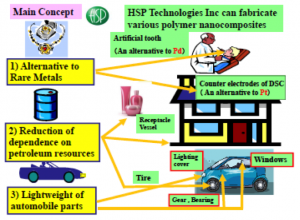 HSP Technologies Inc. succeeded in the fabrication of transparent polycarbonate (PC) and poly(methyl methacrylate)(PMMA) alloys with respective physical properties using the high-shear processing. This material can be applicable in plastic glazing, panels, and optical lens, etc. Moreover, the company has developed the high modulus and lightweight nanocomposites fabricated by the high-shear processing in which carbon fibers are homogeneously and isotropically dispersed in polymer matrix.